Foundation Repair | KC's Improvement & Construction Co., Inc. Foundation Repair | KC's Improvement & Construction Co., Inc.
KC’s Improvement & Construction Co., Inc. is a knowledgeable contractor for foundation repair. We service the Triad area—High Point, Greensboro, Kernersville, Lexington, Reidsville, Thomasville, Burlington, Asheboro, and more—with prompt, reliable service. What Are the Signs of Foundation Problems? Although it’s normal for a home to show signs of settling over time, sometimes there may be evidence of serious issues. If you have noticed any of the signs listed below, it may indicate foundation distress in your home. If you think foundation repair is needed in your home, contact us for an inspection and a free in-home consultation. Usually, foundation damage is caused by building a structure on expansive soil such as clay. Significant losses or gains in moisture can cause serious shrinking or swelling of the soil, which in turn causes the foundation to heave and settle. Houses in the Southern region of the U.S. are especially susceptible to damage due to the high amount of clay in the soil. It is estimated that about 60% of homes built on expansive soils suffer some amount of foundation distress. Foundation piling/piering – Steel piers are driven underneath the foundation with a hydraulic jack, which is then used to lift the foundation to the correct height. Slabjacking – Holes are drilled into the concrete and then filled with cement grout, which lifts the concrete and stabilize the soil. Foundation wall replacement – When the foundation walls are seriously deteriorated, they may need to be replaced. Replacement is usually done with concrete or concrete blocks. 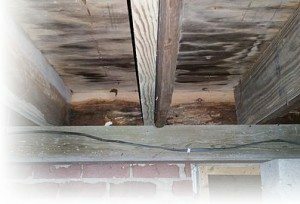 It’s important to diagnose and address any foundation problems quickly, because delays will result in more costly damages. KC’s Improvement & Construction can inspect your home and its premises, diagnose any problems, and repair the damage. We are also available to repair the interior and exterior signs of foundation damage. Call us for an inspection and free estimate.